I was gifted a quantity of lovely walnut slabs that had been pulled from somewhere out of a relative’s barn or carport. The pieces had been cut out of the fork in the tree, and their unique shape both inspired and intimidated me, so they didn’t end up getting used for a very long time. I’m not sure how long they had been sitting wherever they had been, but by whatever series of lucky coincidences, they had been subjected to near perfect curing conditions. Their strength and solidarity endure today; they form the head and footboards of a bed whose essence of appeal lies in the flawless, smooth surfaces preserved by that curing process. If Wood Came Already Cured… That Would Be Nice. It doesn’t, though, so we have to do it ourselves. For my part, I have a large space, specifically designed for this purpose, but if you take out a nice tree from your front yard, and decide you want to make something of it someday, you can accomplish a good air dry at home (on a smaller scale). Most people have heard the accepted normal time allotment for air drying wood: allow one year per inch of thickness, and you’re in the clear. Bottom line, the process takes time, so wherever you decide to do this, make sure it’s a long-term setup. to remember is that your wood is going to change. Shrink, warp, or split (hopefully just the first), it won’t be exactly what you cut, so plan to cut your pieces bigger than you’ll want them to be at the end. Use stickers to separate the lumber—you want as much of the surface of the wood exposed to air as possible. Stack vertically, and as high as you like. The application of weight at several points across the length of the lumber will help the sticks retain their straight edges. Is adding heat. This is tricky, but you can do it easily by moving the wood indoors if it’s been in an unheated space, or you can use a drying cabinet if you have one. Just don’t rush it. Your projects begin with the processing steps, and if you get too excited to cut into your slabs, you’ll wind up with wobbly, cracked wastes of precious lumber. Take your time, do it right, and you won’t regret it. This process has worked for me and other wood craftsman for many years and the core techniques will likely stay the same for ages. 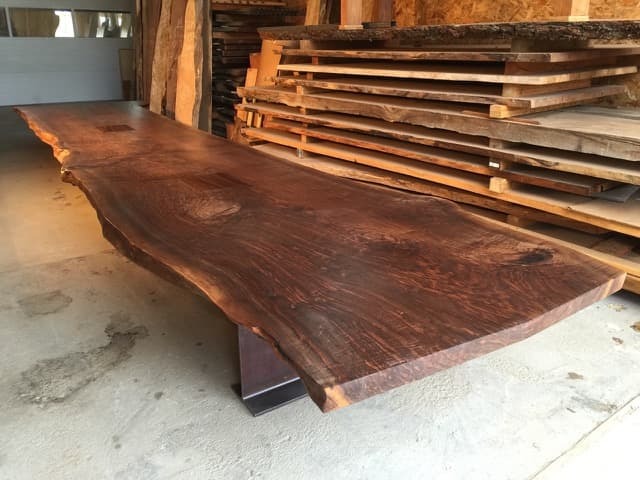 I think it goes without saying but if you are interested in a piece of unique wood slab furniture for your home or office, make sure the wood was cured properly. Not doing so could result in having to fix or replace the piece down the road. Save yourself the trouble and stick with furniture that was built the right way! A Quick Fix For Unwanted Spreading Seams In Your Wood Furniture	Screw It… Or Don’t, The Joys Of Wood Joinery!